Combine two packages of active dry yeast with warm water in the bowl of a stand mixer. Stir until dissolved. Add cake mix, flour, vanilla, and salt. Use dough hook attachment to knead dough together, just for a minute or two. Move to larger bowl, cover, and let rise for about an hour. Punch dough down after an hour, and let rise again for another hour. Here is my dough after the second rise. 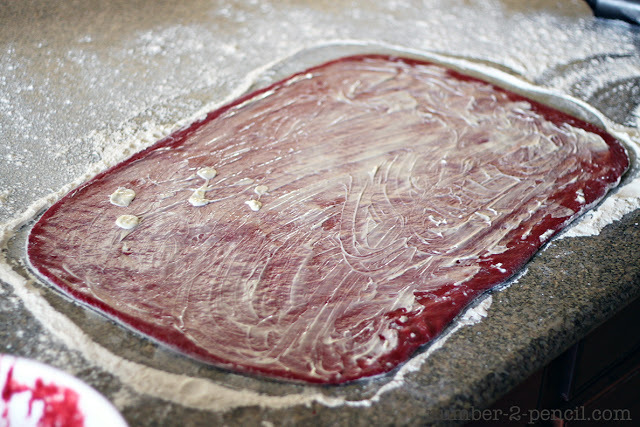 I was giddy over this gorgeous red yeast dough. 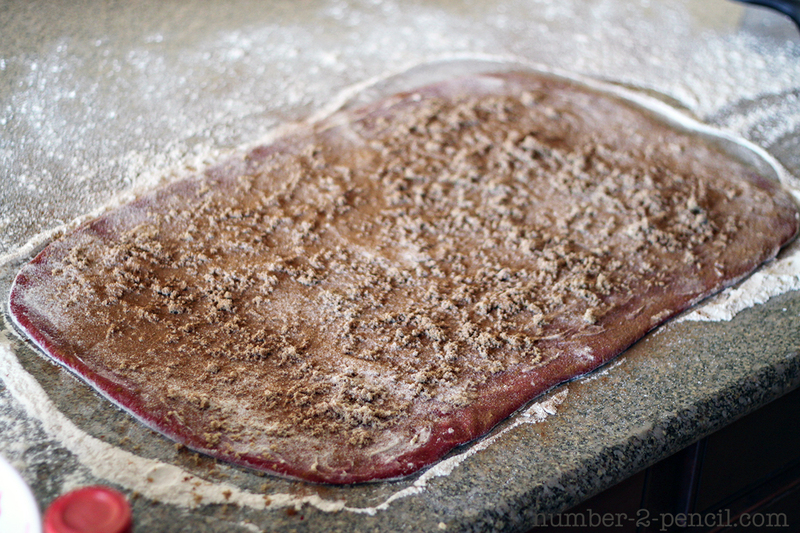 Use plenty of flour on a clean surface, and turn dough out. Shape into a ball, then roll into a rectangle shape. Mine measured about 28×17. Spread softened butter over dough. Sprinkle with brown sugar, white granulated sugar, and cinnamon. 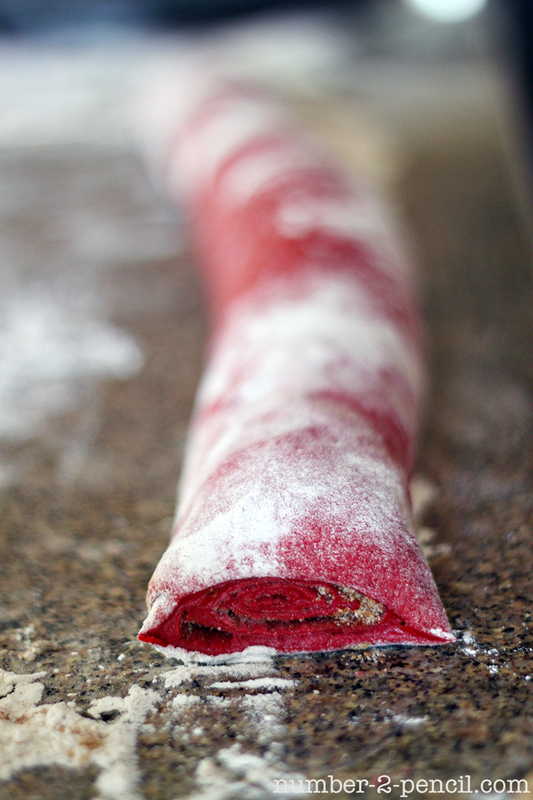 Start from furthest edge and roll dough tightly into a long skinny log, trying to keep it neat and even. I like to trim off the uneven edges. Slice log evenly into 24 rolls. Place rolls in two greased 9×13 baking pans. Cover with plastic wrap and let cinnamon rolls rise a final time in the pan, about 30 minutes, or until they have doubled in size. Bake at 350 degrees for 15- 20 minutes. I made a cream cheese frosting to go over the top. 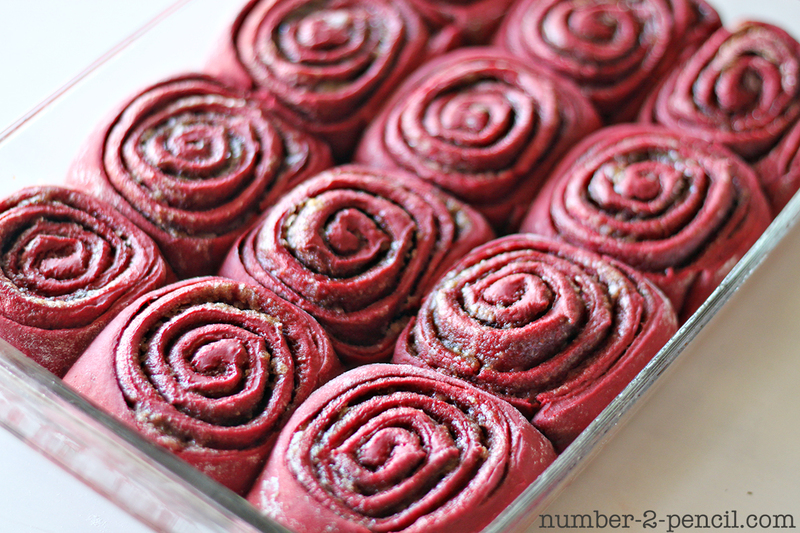 It’s decadent and delicious on these beautiful Red Velvet Cinnamon Rolls. Spread it on while the rolls are still warm. If you are a first time cinnamon roll maker, or if you haven’t used yeast before, this would be a great recipe to start with. The dough is simple and easy to work with. These take about 3 hours from start to finish, mostly inactive prep time. Combine two packages of active dry yeast with warm water in the bowl of a stand mixer. Stir until dissolved. Add cake mix, flour, vanilla and salt. Use dough hook attachment to knead dough together, just for a minute or two. Move to larger bowl, cover, and let rise for about an hour. Punch dough down after an hour, and let rise again for another hour. Use plenty of flour on a clean surface and turn dough out. Shape into a ball, then roll into a rectangle shape, mine measured about 28×17. Spread softened butter over dough. Sprinkle with brown sugar, white granulated sugar and cinnamon. Start from farthest edge and roll dough tightly into a long skinny log shape. Slice into 24 rolls. Place rolls in two 9×13 pans that have been greased with butter, or sprayed with non stick cooking spray. Let rise a final time in pan for about 30 minutes. While the rolls are baking, prepare cream cheese frosting. With paddle attachment on the stand mixer, combine room temperature butter with powdered sugar. Beat until well combined, then add vanilla and pinch of salt. Mix again, then while mixer is going, drop cubes of softened cream cheese in the bowl one at a time until frosting is well mixed. Spread on warm rolls and enjoy. If you are planning a brunch, check out my tips for planning an amazing brunch! Some of the content in this post was sponsored in partnership with Ebay. Oh my gosh, Melissa, those are GORGEOUS! They definitely need to happen during the holidays, or, uh, any day! I can see these adding beautiful color to my Christmas family breakfast this year! Thanks so much for sharing!! Oh my!! I think I’m going to the grocery store today. 😉 Thank you so so much for sharing this wonderful dessert! Seriously drooling!!!!!!!!!!! I have been meaning to make regular ones for a while now- but after seeing this- clearly it’s the only way to go. Just gave these yummy cinnamon rolls a shout out on FB 🙂 These look SO delicious! Thanks for sharing the recipe! This looks so good im making them for Christmas but first i have to make a batch first to have some fun with my kids, thankyou for the recipe. I was thinking the same thing. I can’t imagine cinnamon with red velvet but cocoa powder sounds spot on! Has anyone tried it yet? 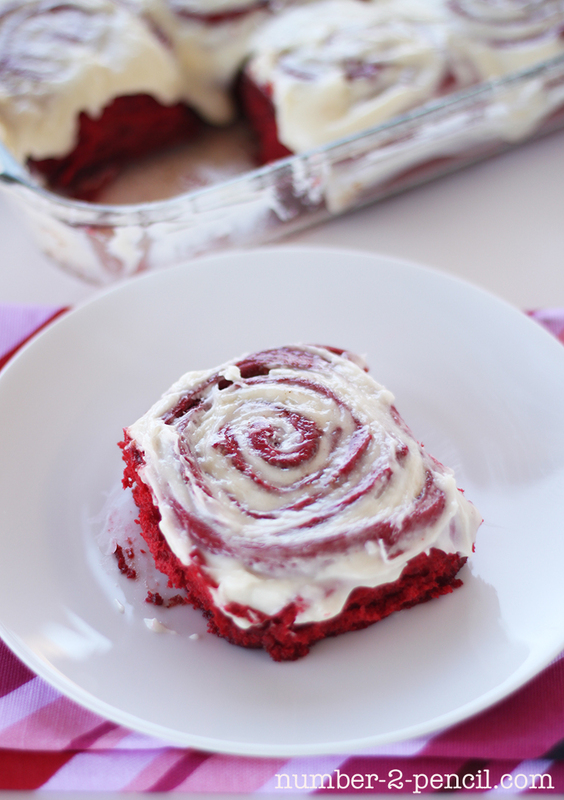 This is so innovative – red velvet cinnamon rolls! Beautiful presentation! Is there a way to let them rise over night? Or would that be too long? They might over rise. I would suggest par baking them the night before and finishing them off in the morning, if you want fresh baked rolls. This looks delicious! 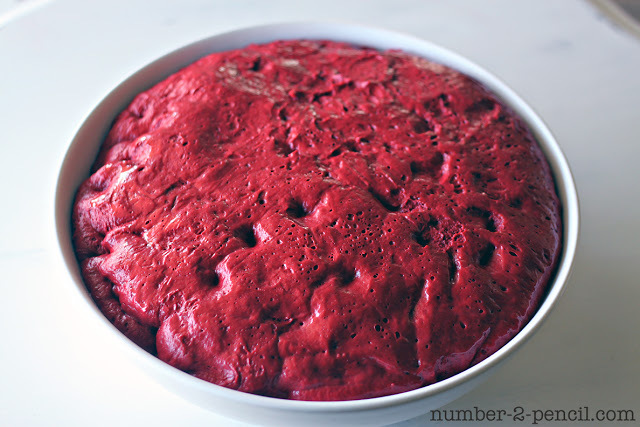 I just shared this recipe on my red velvet blog http://momelite.com/red-velvet-heaven/. I hope you don’t mind! 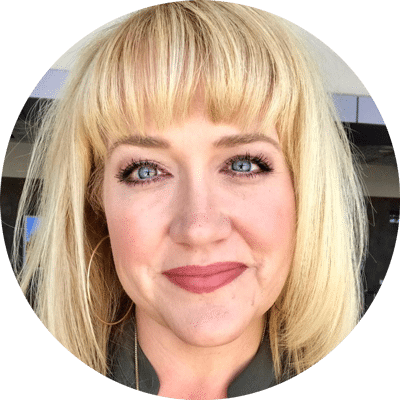 Just pinned these – found you through Nikki’s linkup. Wow. They are incredible looking! 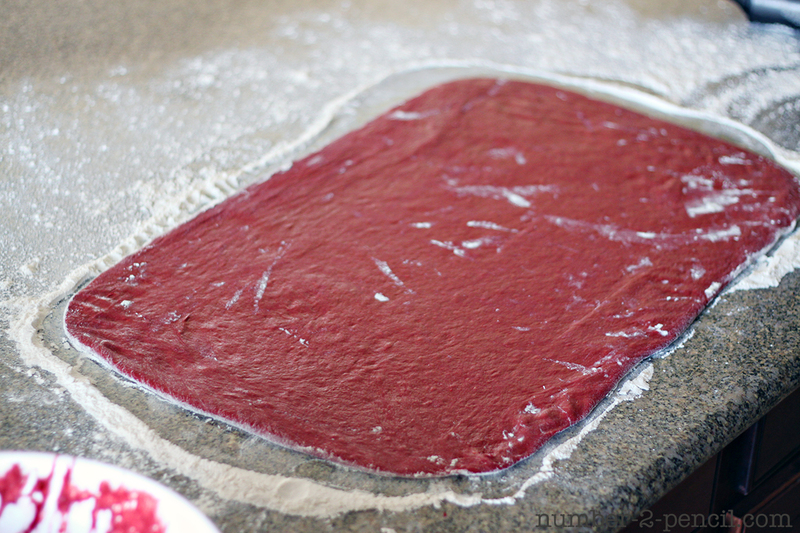 I’ve never seen RED dough like this and how cool. And fabulous tasting I bet! Hi, I was wondering the specific measurements are for the active dry yeast were. Thanks for the question! It’s two 1/4 oz envelopes, so 1/2 oz of active dry yeast total. I’ve updated it in the recipe too. I really want to make these for a party this weekend, but I’ll be short on time after today. Can I make them and freeze them before baking? Maybe I could parbake them and then freeze them? I would probably just parbake them the day before and finish them the next day. Enjoy! I made these and I have cooked them 3x now, and they are still raw. I’m sorry you are having trouble. Did you notice the recipe is for two 9×13 pans of cinnamon rolls? If you make two pans, the rolls aren’t thick at all. The middle rolls will be slightly firm to the touch when they are cooked through. How much cinnamon do u put in the filling??? I don’t have a set amount, I just keep shaking until I get good coverage:0) See pic for a visual! Do you have to use the packet mix or does it work making the cake from scratch??? This recipe is specifically for the cake mix. I am from Cape Town, South Africa and we don’t get the Duncan Hines Signature Red Velvet Cake Mix here. Do you have a replacement recipe I can use for this cake mix? I made these last year for Thanksgiving morning and had a whole pan left over and I did freeze them before the final rise. I pulled them out of the freezer a few weeks later and let them thaw on the cabinet and complete the rise, then baked them. They were wonderful. Hi, I made these over Christmas and they were delicious! I blogged about the ones I made. It will post on Wednesday. I made sure to mention your blog in the post. Thanks for the idea! Ok, so these are a bit of a pain but they are sol worth it!! My roommate and I make them so often it’s probably unhealthy. They are sooooo absolutely delish, though. Love them. Oh no! Subbbing wheat can be tricky. I’m sorry it didn’t work out! 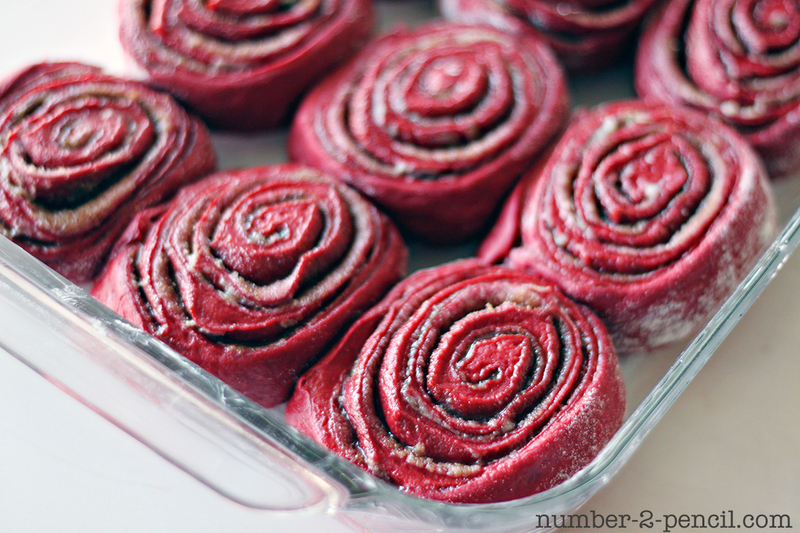 Made these as a part of a “12 Days of Red Velvet” I am doing this year for the holiday season. They were absolutely delicious and very easy to make. I ended up adding some cocoa powder to the filling for even more chocolate flavor. The frosting was AMAZING as well!!! Thanks so much for a great recipe. 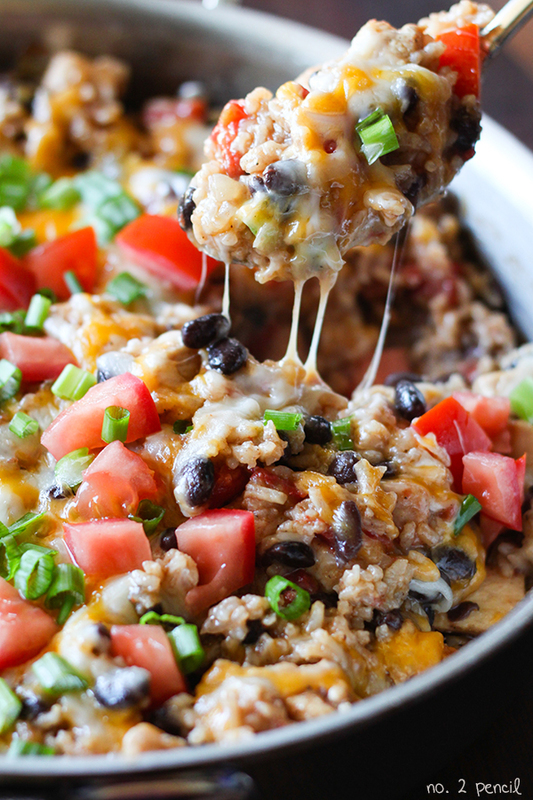 THANK YOU SO MUCH, Melissa, for sharing this recipe!! As I am just a single lady, I could always do a full batch and freeze them but do you think this recipe could be “halved” easily??? I LOVE this recipe. I have made is several times and it is always impressive. I have even tried it with other cake mix flavors and it always turns out great! The only thing I do differently is let my warm/hot water sit with my yeast for about 10 minutes before I mix in my cake mix and flour and such. This is probably a basic yeast tip most bakers would already know but I didn’t until after my first batch wasn’t so fluffy. Amazing cinnamon rolls!!!!! Do you have to mix the cake per box instructions first, or do you just mix the dry cake mix with the yeast and other ingredients?? I LOVE this recipe! I make these for my friends and family all the time and yhry love it. Theyre gone like that. I want to give them as gifts. How would you recommend I do this? Sounds great! You can buy disposable cake pans and use those! Some even come with plastic lids and you can add a bow. That’s how I have gifted them in the past.